In the UK, the construction industry has embraced modernisation, benefiting significantly from adopting BIM technology. Building Information Modelling, or BIM, is a core plan in the UK’s Government Construction Strategy efforts that began in May 2011. The technology involves creating and managing a digital model of a building or infrastructure. In the past, blueprints were used to convey ideas about a particular building plan. Today, we have the technology to visualise realistic dimensions on a smaller scale, making the planning process significantly easier. The idea behind BIM is to encourage collaborative work between builders, designers, clients and other parties throughout the lifecycle of a construction project for enhanced efficiency. The true power of BIM lives in the ‘I’: information. The information gathered in construction projects – from conception to completion – isn’t just stored, it’s configurable. Your data can be used to express design intent, improve knowledge transfer and reduce field coordination problems. The Government Construction Strategy states that all government construction projects should work according to a minimum of Level 2 BIM by April 2016. This requirement in the public sector resulted in an overall increase in BIM processes, matching the proficiency in the US, Scandinavia and Singapore. After the UK government recognised the success of the Government Construction Strategy, they committed to a higher budget for Level 3 BIM usage. More and more architects and large contractors in the UK have adopted BIM technology with great enthusiasm. Improved Clash Detection – BIM software tools are noticeably effective at detecting clashes, leading to improved project efficiency. Higher Quality Projects – Since BIM promotes effective management of detailed information, you can expect higher quality buildings. BIM will help ease the design, planning and building of more complex infrastructures. Better Project Lifecycles for Smaller Markets – Since BIM optimises construction processes, it can help those who do not have access to the right tools and equipment for expansion. Productivity Boost – When you can share information in an easier and faster way during a project, productivity is bound to increase. Time spent on reworking parts of your project can be reduced through harmonious collaboration. BIM also allows you to minimise costs and streamline operations. recognise that there is an issue to resolve. This is because the new process needs to be tackled on a systematic and cultural level. Without a complete acceptance of the technology, construction businesses won’t be able to make the most of the benefits of BIM. This level indicates low or no collaboration and is the most basic step in the generating process. Only 2D computer-aided design (CAD) is used, mainly for producing data. The output from Level 0 BIM consists solely of paper and non-interoperable electronics. Even if 2D drawings are used in this level, the generated information models for the construction projects are kept confidential. For drafting approval documentation and production information in this level, both 2D drawings and 3D CAD are used. Many businesses in the UK conduct construction projects in this manner. A contractor usually manages the data and shares it online to the parties involved through a Common Data Environment (CDE). The UK government hopes to see Level 2 BIM implemented amongst the majority of future construction projects. Level 2 BIM includes 3D models that will be prepared by different design teams and shared with all relevant stakeholders. The models will include documents and data files with detailed data regarding the floors, spaces, systems and components. Stakeholders can also modify the data as needed. A single shared model hosted centrally provides stakeholders with access to the model and permission to modify any data. The goal of this level is to eliminate any conflicting information and attain full integration in a cloud-based environment. With 6D technology, Level 3 BIM is expected to progress the construction industry’s end-to-end processes. Undoubtedly, the future of construction will be collaborative and digital. The strategy – through open, shareable asset information – improves the overall value of every construction project. 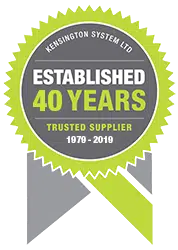 Founded by Marcus Huntley, Kensington Systems Ltd has been designing, producing and installing bicycle shelters, canopies, window blinds, and other shading products for various sectors across the UK. With our enduring policy of continual improvement, we have become a world leader in shading solutions with a reputation for innovative processes and unparalleled service. Request a call back by filling in your details below or call us on +44 (0)117 958 9933.